At Asmech our experienced design team can offer drawing and design services in both 2D and 3D. When choosing Asmech, you can expect high quality and efficient systems while safe in the knowledge that all our solutions aim for a reduced carbon footprint. We are proud of our design team who consistently produce bespoke design conveyors. Our Design team can produce 2D drawings that accurately portray production line layouts, detailed machines and electrical schematics. Alongside the 2D drawn plans, our designers can also create comprehensive, interactive 3D mock-ups for the customer to explore using VR technology. This is done by using Oculus Rift; this device uses custom tracking technology, providing ultra-low latency 360-degree head tracking, allowing customers to look around a virtual world, and showcasing to them the potential system they will be getting. The Oculus Rift can create a stereoscopic 3D view. This view has brilliant depth, scale and parallax. This 3D image however, is a lot different to the ones seen on television or at the cinema. Oculus Rift presents unique and parallel images for each eye, customers wear a headset to achieve this. By doing so, customers will perceive images much like how they would in the real world. The whole experience feels much more natural and comfortable. These 3-dimensional drawings not only provide benefits for our customers, but they also help us. Being able to see a machine we are manufacturing in this way allows our team at Asmech to improve the functionality at the design stage. It can single out any design errors, and in doing so, reduces the overall design time. Furthermore, the drawings and animations that are produced by the Oculus Rift can be used for reference at our customer’s specific premises. 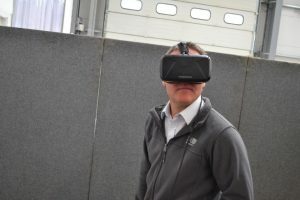 Oculus Rift allows our teams at Asmech to produce bespoke design conveyors; it helps us explain the concept of a system and the benefits that it can bring to a customer’s business. By putting the customer in a 3D world where they can see it for themselves. If you would like a new conveyor handling system and be able to see the benefits and the product working before it has been manufactured by us, then call us today on 01623 424 442 or fill in one of our enquiry forms.